Guernsey FC manager Tony Vance hailed striker Ross Allen after he won the golden boot at the Non-League Paper's National Game Awards. The 27-year-old striker scored 54 goals this season as the Green Lions reached the play-offs in the Isthmian League's Division One South. Allen netted in 11 successive games between 31 August and 26 October. "He's good enough to be a professional footballer and play in the league," Vance told BBC Sport. Allen scored on New Year's Day and has an overall record of 167 goals in 132 games. "I'm amazed that clubs have never taken a punt on him because he scores goals at every level," said Vance. "Year-on-year his goal tally's increasing, which shouldn't happen when you go up in standard. "He's scored against league clubs and Conference teams, he's just got what it takes." 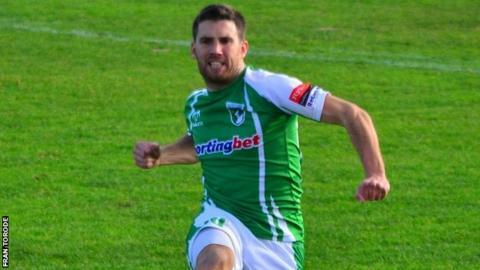 Allen was a prolific scorer in Guernsey's island league, but has continued to find the net regularly since Guernsey FC joined the English league system in 2011. "One thing's for sure, we're very lucky he's proud to play for Guernsey," Vance added. "Professional football is a ruthless, mercenary business and most people in Guernsey aren't brought up that way. "Now we have Guernsey FC as our forum that can only be of our benefit."